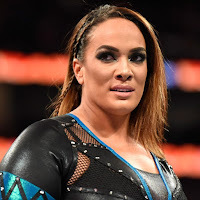 Nia Jax took to Twitter after Charlotte Flair was sent to the SmackDown brand last night and claimed RAW as hers. Nia is now competing in a RAW women's division that features Mickie James, Alexa Bliss, Emma, Dana Brooke, Alicia Fox, Sasha Banks, Paige, Summer Rae and RAW Women's Champion Bayley coming out of the "Superstar Shakeup" event. A queen who lost her crown. Stay on #SDLive, @MsCharlotteWWE #Raw is my show now.